A species of fish, the cleaner wrasse (Labroides dimidiatus), responds to its reflection and attempts to remove marks on its body during the mirror test—a method held as the gold standard for determining if animals are self-aware. The finding, publishing on February 7 in the open-access journal PLOS Biology, suggests that fish might possess far higher cognitive powers than previously thought, and ignites a high-stakes debate over how we assess the intelligence of animals that are so unlike ourselves. The study's researchers from the Max Planck Institute for Ornithology (MPIO) and Osaka City University (OCU), say that their results provide clear evidence of behaviours that appear to pass through all phases of the mirror test, but that the interpretation of what these mean is less clear: Does a 'pass' mark in the mirror test demonstrate that fish possess self-awareness—a cognitive trait thought only to be present in primates and some other mammals? Or can the mirror test be solved by very different cognitive processes than previously thought? "The behaviours we observe leave little doubt that this fish behaviourally fulfils all criteria of the mirror test as originally laid out. What is less clear is whether these behaviours should be considered as evidence that fish are self-aware—even though in the past these same behaviours have been interpreted as self-awareness in so many other animals," says Dr. Alex Jordan, senior author on the study. The ability to perceive and recognise a reflected mirror image as self (mirror self-recognition) is considered a hallmark of cognition across species. 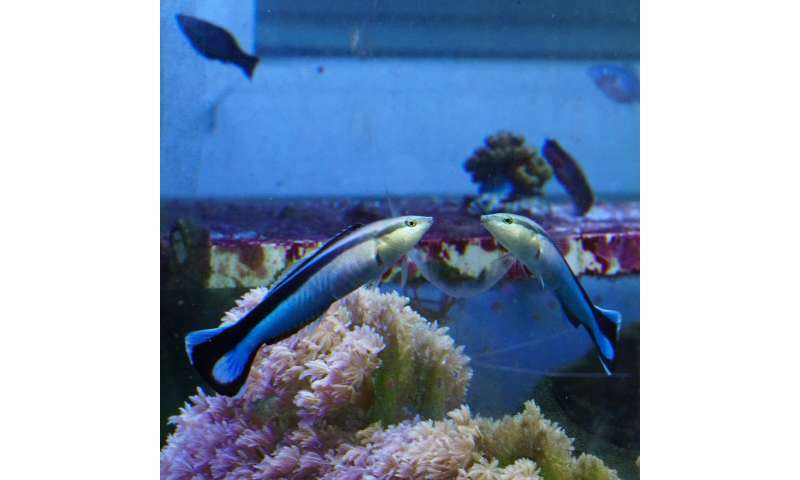 To test for this phenomenon in fish, the researchers applied the classic 'mark' test to the cleaner wrasse (Labroides dimidiatus)—a marine fish best known for its behaviour of "cleaning" external parasites from client fish—by placing a coloured mark on fish in a location that can only be seen in a mirror reflection. In order to gain a 'pass', the test requires that the animal must touch or investigate the mark, demonstrating that it perceives the reflected image as itself. This is clearly a challenge for animals such as fish that lack limbs and hands. The researchers observed that fish attempted to remove the marks by scraping their bodies on hard surfaces after viewing themselves in the mirror. Fish never attempted to remove transparent marks in the presence of a mirror, or coloured marks when no mirror was present—suggesting that marked fish were responding to the visual cue of seeing the mark on themselves in the mirror. Further, unmarked fish did not attempt to remove marks from themselves when interacting with a marked fish across a clear divider, nor did they attempt to remove marks placed on the mirror itself—suggesting that fish were not innately reacting to a mark resembling an ectoparasite anywhere in the environment, for instance due to hard-wired feeding responses. Dr. Jordan acknowledges the controversial nature of the study, saying: "Depending on your position, you might reject the interpretation that these behaviours in a fish satisfy passing the test at all. But on what objective basis can you do this when the behaviours they show are so functionally similar to those of other species that have passed the test?" The statistics are powerful but based on few individuals, so need repeats with much more fish to show robustness. That said it is interesting and the initial work that did the rounds earlier this year has been much improved on. ""What if self-awareness develops like an onion, building layer upon layer, rather than appearing all at once?" asks de Waal." What is that question was never posed until a distant vertebrate relative to earlier "appears intelligent" species were tested, potentially showing a deep and basal trait? But anyway, that - possibly basal trait going into self-awareness - would be the advance whether or not self-awareness is an onion or a potato.